If you have a bunch of old, used blu-rays that you don’t really watch anymore, or don’t plan on ever watching again, you are probably wondering what to do with them. You may even have a few that were gifts and you never plan on watching even a first time! If you’re simply not sure what to do with these blu-rays, or you simply forgot about them, why let them sit on your shelf and collect dust when you could potentially make some money back from them? After all, Netflix, Redbox, and other similar services are still out there for all of your movie-watching needs! 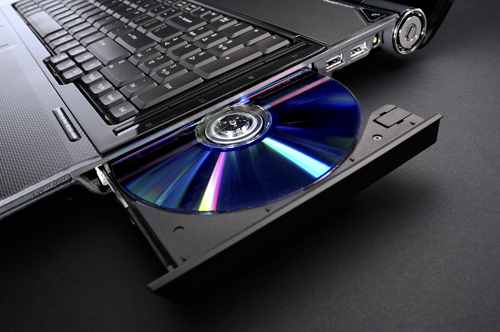 Check out these following places for some ideas on how you might best be able to unload those unwanted blu-rays for some quick and easy money. eBay is a very easy to use service that most people across the world have heard about by now. 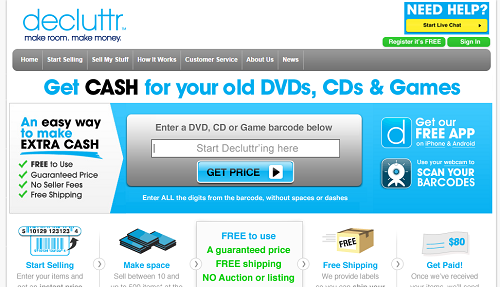 It is one of the original online services for selling or buying used stuff. So many people still use it to this day. Sellers are able to sell their used items fast and for a decent amount, and if you sell with them, you are relatively in charge of your own prices. Naturally, if you just use an auction type listing and set the starting price at $0.99, you have to just see where the auction goes, but there are other ways to ensure you get at least the minimum price you believe your blu-ray is worth. They offer “buy it now”, allowing you to essentially just sell your item outright as an additional option to your auction. There is also an “or best offer” in addition to this feature, allowing even more flexibility to help ensure that you sell your movies. You can also set reserves, meaning the auction must get to a certain amount before it can be sold successfully, or you can cancel the auction if it is not sold for enough. This method also offers both seller and buyer protection through eBay and PayPal. Selling blu-rays on Amazon is easy; they tend to sell for a decent amount, and you are in charge of your own prices. You can easily choose how much to sell your item by viewing other listings – Amazon shows all competing prices to give you an easy idea of what to price at, including brand new condition items. There is also fraud protection through Amazon, ensuring that you are protected from scams and buyers trying to get free items from you. There are fees associated with selling blu-rays on Amazon, but the sheer volume of people viewing your blu-rays gives you a great chance to sell them fast. Another great service that Amazon offers is their trade-in program. You can trade in eligible items for an Amazon gift card. Shipping is free for you to send your items in to Amazon, as well. You receive an instant offer online with no registration or listing required. You can easily check first to see if it might be worth trading in before listing your own sale. The only downside to this feature is that they only give you an Amazon gift card, not cash, but they offer very competitive pricing and you are almost guaranteed to get the prices quoted, given your items are in decent, working condition of course! This is in comparison to the regular seller listings, where you can offer items to buyers in essentially any condition as long as you are honest and up-front about them – after all, you don’t want to deal with any returns and refunds for items that you have wrongly advertised! 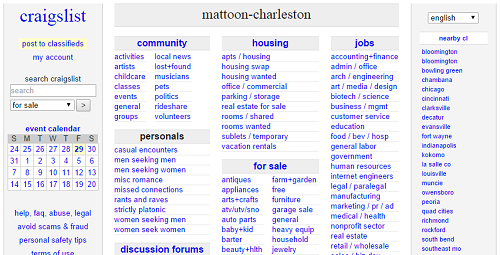 Craigslist is very simple and easy to use. The website still essentially looks like it did when it was originally launched many years ago, so it is nothing fancy, but it is entirely free: there are no fees to use it at all,many people use it, and you can sell blu-rays for whatever you want to – you’re in complete control of your prices, and there is usually no shipping involved because you can meet people locally in order to complete sales. Unfortunately, it is sometimes easy for people to scam you or waste your time; some buyers are not really interested in completing transactions, they may want to trade other items instead of pay cash, or they want to offer very little for your item. There is also no seller protection – it’s all up to you as the seller to be in charge of the entire transaction. It can also be difficult to navigate the website, both for you and buyers. It can be difficult to check out competing prices, too. Finally, there is also no guarantee that someone locally is interested in your blu-rays, meaning less people may see your item listings since Craigslist usually deals with only local listings with people in and around your area. f.y.e., or “for your entertainment”, is a store that can commonly be found around the US. Wherehouse is another name of a very similar store under the same company. However, if you happen to have one near you, you cannot bring your blu-rays into a store to trade them in. However, you can use their websites to sell blu-rays and other items directly online. They also offer an option that allows you to sell in bulk. This allows you to quickly search for the prices they offer on your movies if you have many to sell. Items must be in good shape in order to receive the money for them, and you may also not trade in more than 2 copies of the same movie. As a bonus, they also offer to reimburse you for some of your shipping costs depending on certain criteria. Their website is relatively easy to use; it allows you to search by keyword, where you can put the title of the movie in, or by UPC, which brings up the exact product you have in your possession. As long as you choose the correct items, everything should go perfectly. You checkout just as if you were purchasing items online. After you’ve created an account with them, you will be able to choose and verify your payment information. They offer to pay you by check, which is issued within 3 business days of them receiving your items, PayPal, which will arrive in your PayPal account within 3 business days after they receive your item (may include PayPal processing fee), or store credit, which will arrive also within 3 business days. You can use the store credit to purchase items from f.y.e. Decluttr.com allows you to sell your blu-rays for cash, along with other items. You must have access to the barcodes on the blu-rays you wish to sell. You enter the barcodes of the items into their website and receive instant quotes for the prices they are prepared to offer you for your movies. You can type the barcode numbers in manually or even use your webcam or iPhone/iPad (using their app) as barcode scanners to quickly scan the barcodes directly into the system. Naturally, the discs must be in good condition in order to trade them in to Decluttr. Decluttr is completely free. They even pay for all shipping costs of movies you trade in to them. They offer services through both UPS and USPS. However, there is a minimum requirement of trading in at least 10 items in order to complete a transaction. They also do not require any banking details on their website – they pay you by check, so all you have to do is sign up and enter your name and address. They do not state an exact timeframe for all of this, but they promise that you will get your money “in next to no time… easy!” Once they receive your items, they will go through a “quality assessment process”, After this process is complete, they will them mail you your check for the value of your trade-in. 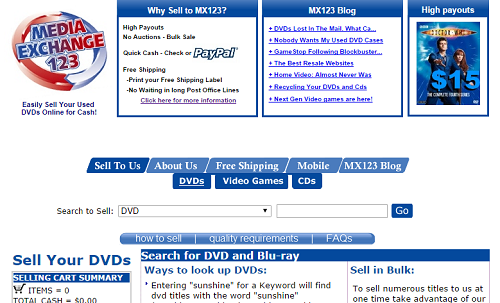 Media Exchange 123, or mx123.com, is as simple and easy as its name suggests – you can sell your blu-rays as easily as counting from 1 to 3! You can quickly look up the value of your blu-rays on their site by typing in the titles, entering the UPCs in, or by entering other key words that may help you locate the blu-ray you’re trying to sell. They also offer you the option to sell blu-rays in bulk. Again, your blu-rays must also be in decent condition before selling them to this site. To make this easy, they list all of their quality requirements – read up on them if you are not sure about your blu-rays’ condition! If you’re feeling particularly lazy, or if you just don’t have the time, you can skip the part where you enter each title or UPC entirely. You can just send the company your blu-rays and they will do this work for you. Please make sure you are okay with not knowing the value of your blu-rays until they arrive at Media Exchange 123 first, though! One final detail about this site is that they also allow you to sell blu-rays without the original cases or artwork, as well. This is useful if you just have the discs and have lost everything else. They pay less, but they still offer the option to sell your blu-ray discs, which is a great option. This store is owned by the same company, and runs very similar to, GameStop. If you are familiar with GameStop, they sell new and used video games and systems of all kinds, and they also offer services for customers to trade in their old gaming-related items. MovieStop is very similar, except they offer these services for movies, including blu-rays. They offer decent prices and often have promotions where they may give you bonuses on trade-in values. While GameStop has been around for a while, MovieStop is still a relatively new service. As a result, they unfortunately only allow you to trade things in while visiting a store in-person, and they only have locations in a few states on the east coast and in the south. This is a store to keep an eye on, though – they may open one up near you soon! Just like GameStop, it is very easy to walk in, get your items appraised, and walk out with the money for them. While this forum is essentially devoted to just North America, there is also an option to sell internationally. This opens up your options so that you can reach a wider audience to sell your blu-rays to. You should do some research before listing your blu-rays for sale – make sure that you are getting what they are worth, and don’t let other users try to buy your movies for next to nothing. While this forum offers you the tools to sell, it is ultimately up to you to finalize each transaction and make sure that both you and the buyer are satisfied with each blu-ray sale.